Having never practised or studied music, this survey course was both relatively simple, and challenging enough to keep me hooked. The Prof is very engaging, and peppers the material with humor, context, and helpful analogy. All this, and excellent praying and delivery (I initially mistook him for Alec Baldwin). Greenberg invents many stories in order to buttress ideological arguments intended to debase and deconstruct western classical music. Another academic hack of the usual type. I need to start this review with my background and motivation for my review to make sense in context. I would like to consider myself a fairly well-educated person holding multiple degrees from three different universities. Somehow, though, my education completely omitted anything involving music. Sure, I was required to take fine arts electives in high school and college, but I managed to miss music appreciation entirely. Needless to say, I have never picked-up an instrument, know next to nothing about music fundamentals, and have not one ounce of music talent or ability. This deficiency in my education never caused a problem until I learned that my daughter is required to learn an instrument and take music during middle school. Thankfully, my wife played an instrument through high school and has at least some ability to help my daughter as she starts this part of her education. I do not, however, like being ignorant and do not want to be in the position of being utterly clueless about what my daughter is learning. Thus, I am motivated for the first time in my life to learn at least something about music. I have experience with the Great Courses series and thought this would be the place to start my delinquent musical education. I am glad that I did. 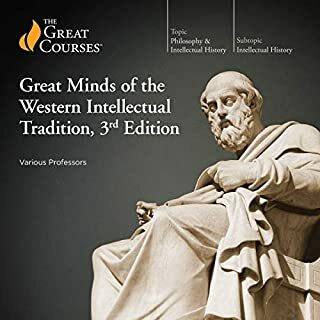 The professor uses a historical approach, which works well with the way that I think, and takes the student through Ancient Greek music all the way through the early part of the 20th Century. A complete list of the topics can be found on the Great Courses website. The professor presents the thesis throughout the course that music is a mirror of the people who composed it and the time in which it was created. 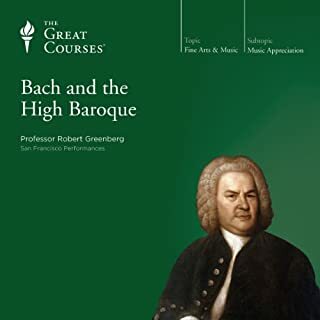 This is a long course and requires a lot of dedication, but the professor slowly builds a vocabulary for the student helping someone like me with zero background begin to understand the way that music is composed. I will freely admit that much of what the professor explained still went over my head, and I frequently turned to Wikipedia for more background information. I decided as my next class to listen to the professor's course on Understanding the Fundamentals of Music to continue building on my knowledge. I bought many of the musical works he discussed in the class so I could listen to them in their entirety and see if I could pick-out some of the details learned from the course. I still feel like a near idiot, but I was proud of the progress I made. For instance, I can now listen to a traditional four movement symphony by Haydn or Mozart and understand why the second movement is typically slow and the fourth movement is typically fast. I can now provide a semi-intelligent answer to explain the stylistic differences between Bach, Mozart and Beethoven. If nothing else, I at least now know which came first. I still have a very long way to go, but I at least have a foundation on which to build. I can honestly say that I now have an interest in classical music (excuse me, to use the terminology from the course—"concert music") and appreciate listening to it, even if I am not yet picking up on all of the subtleties. 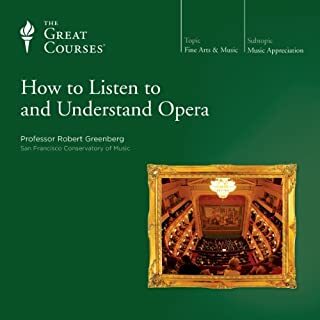 The professor has not yet inspired me to go so far as listening to opera in my spare time, but I am now eager to learn more about music. If I have any complaint, it is that I would like more guidance on where to go from here. 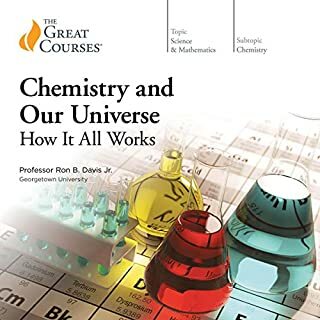 There are more than a dozen courses in the Great Courses collection by this same professor. It would be nice to have a recommendation at tend end on which courses to take in which order to build a good, solid foundation of musical understanding. 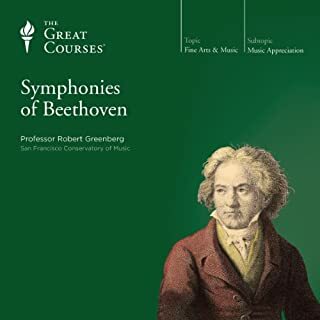 I assume the music fundamentals course that I just started is a good second stop on this journey, but I wonder what the professor would recommend in terms of taking courses on specific composers, the class on the symphony, the class on great orchestral works, etc…. As a closing note, I read criticisms of the professor in other reviews for his frequent, sometimes corny, jokes. I might be in the minority, but I actually liked most of his jokes because it made the material more relatable and kept the mood lighter, though, yes, the jokes can be corny at times. 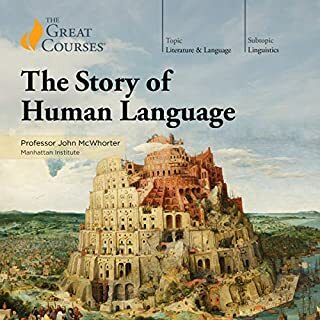 This is a course that could have very easily turned into a high-brow, hoity-toity snob-fest designed to intimidate the neophyte listener. The professor's casual, yet respectful, attitude kept that from happening. This was an excellent course for a complete beginner, and I imagine that someone with more background would get even more out of it. 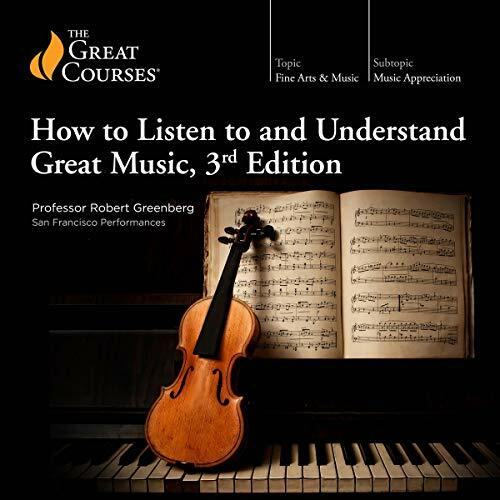 Would you consider the audio edition of How to Listen to and Understand Great Music, 3rd Edition to be better than the print version? There is no print version! Good music is always moving. I've been wanting this for YEARS... but audible has made this affordable for me. MORE intellectual Teaching company! 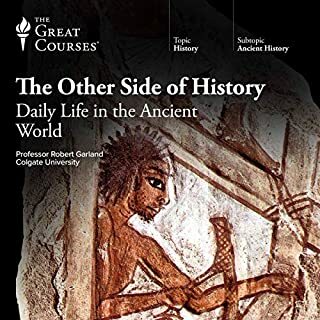 These Great Courses were the reason I signed up for audible initially, but have found so much more here. This is a marvelous course, and I will definitely purchase more by this professor. I spent my college years pursuing practical courses in my scientific field, so this is an opportunity for me to finally take the "I wish I could" classes, in a way, that I never was able to before. Thank you so much for offering these. Please, audible, can you have your software let people break things up into chapters, or lectures? 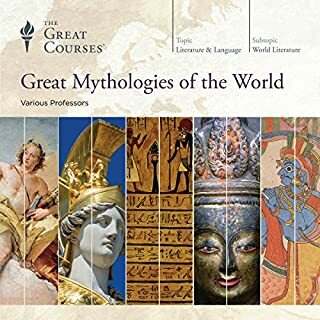 I download these, and to have 36 lectures break up into 6 parts (For example; for the first section is: 1-Music as a Mirror; Sources—The Ancient World and the Early Church; The Middle Ages; Introduction to the Renaissance; The Renaissance Mass; The Madrigal) - well, that's just impossible to search or list on my media player! When I want to go back and find an area, it's very difficult to find - the chapters are just very tiny increments apart on the "bar". See how much nicer and cleaner? That would make me so much happier! I have the same problem with chapter books. I just listened to Anne of Green Gables (marvelous, by the way) and wanted to find the part where Anne dyed her hair green. It was so hard to do, as a 9 hour book is only in one piece! Please find a way to let us break the courses into smaller, more practical parts, such as by lecture and chapter. 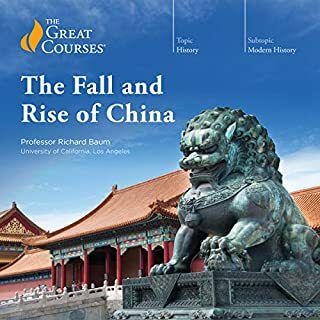 As someone who has listened to more than 40 courses from the Great Courses series, this one is simply the best. 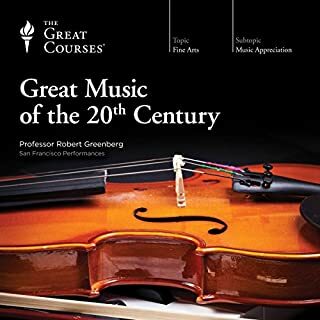 Since music was not my main interest, I was reluctant to invest $100 in this course from the GC website but jumped when I saw it offered by Audible for 1 credit because Prof. Greenberg had been most highly rated (4.8) by those who purchased the course. I admit to being initially disappointed by the professor's more informal and expressive approach which seemed geared to college Freshmen accustomed to listening to Hip Hop on their I Pods. But by the second lesson I was hooked for several reasons. First, the man not only knows his music, he loves it and his enthusiasm is infectious. 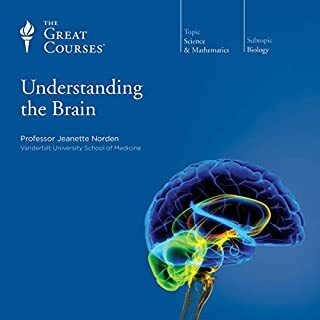 Second, he approaches this course more like a coach than a teacher: leading the listener step by step through the music selections, reviewing main points from earlier lectures to bring the listener back up to speed, and asking leading questions to keep the listener's head in the game. Third, his rants are entertaining whether they are making a point or settling a score with other musicologists and he has some killer throw away lines. The bottom line is that I now have the classical station preset on my car radio and, with a basic understanding of the approach of the composer and of the era of the music, I enjoy listening to it. 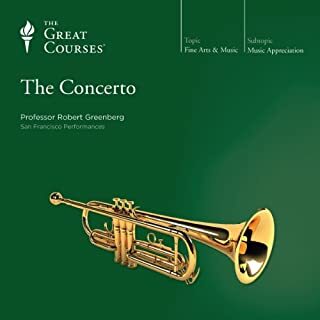 Prof. Greenberg provides the key to understanding this music and I suspect that many of his students at Berkeley have also added Mozart and Verdi to their playlists. 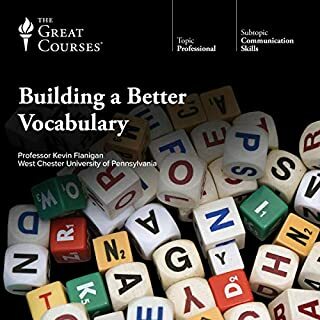 The only drawback is that the course notes are not included with the audio download. While this is not important for many of the Great Courses, it would be a valuable accompaniment to this course. But then again, with an $85 savings through Audible, this minor complaint, like Beethoven's Fifth, is resolved by Bob Greenberg's major accomplishment. 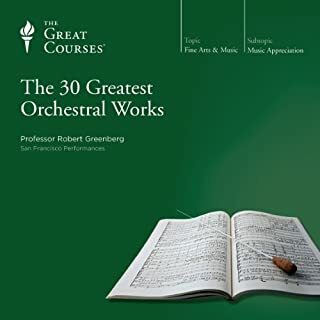 Where does How to Listen to and Understand Great Music, 3rd Edition rank among all the audiobooks you’ve listened to so far? It was long but I had the time available for it. I am in love with Professor Greenberg. I wish I had attended even one lecture in college as interesting, entertaining, and informative as this. And I want more. The others that I had hoped were similar just did not measure up. His wit mixed with his passion for his subject was wonderful. Now I'm going to add all his lectures to my wish list. So this is what musicians secretly know! This was one fantastic audiobook! 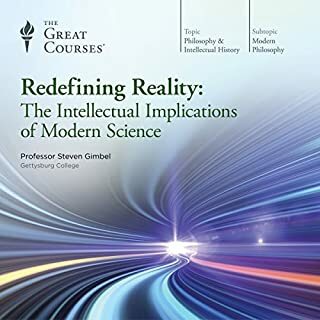 This is part of the the Great Courses lecture series and if you order it through Great Courses it would cost about $300. However, if you order it through Audible.com, it costs one credit, which is about $14.00. the only difference is that you don't receive the written course material, which might have come in handy on occasion but is not necessary to enjoy this incredible experience. So what is this great experience? It is nothing short of a 48 lecture course on, exactly as promised, how to listen to great music! Each lecture is 45 minutes, so that adds up to about 40 hours of listening time... quite a commitment. 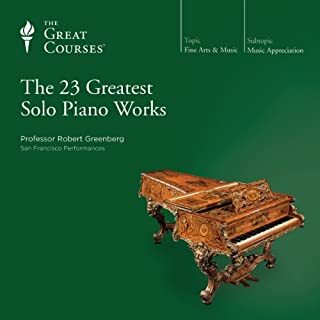 Robert Greenberg is a music professor who seems like the type of person that if you met him at party you would feel like you knew him your whole life. His enthusiasm for music is contagious. He is a great story teller and has a way of describing music in such a way that "it sticks". Like most great teachers, he tells you what he is going to teach, teaches it, then summarizes what he just taught. As he frequently says, music is a mirror of the time, so he adds historical insight into the description of the music. He doesn't try to cover everything, that would be impossible, but takes a longitudinal approach, beginning with the ancient world and quickly moves forward to the baroque,classical and romantic period. In the process he defines musical vocabulary that conductors, composers and music producers seem to think we all understand but don't. 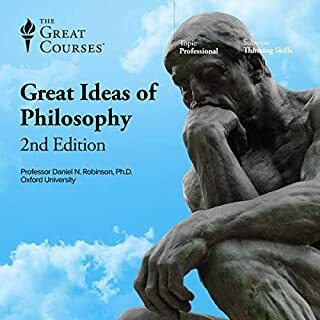 In the process he not only clarifies our ability to perceive what the composer's intent was in the creation of the music, but also helps us to understand their brilliance in making complexity seem so simple. You could say the same thing about Professor Greenberg himself... New Jersey native that he is, he has not lost his direct and irreverent manner of speaking, even while living in California. He is the only person who convinced me that I should really give opera a chance... I did... and sad to say... I still don't enjoy listening to the vocals, much as I like the orchestration. Each to his own, I guess. I would definitely order another one of these (he has many..). Makes for a much more enjoyable car ride. 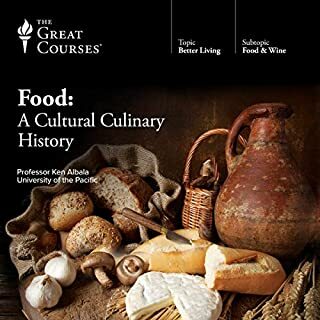 The recent addition of the "Great Courses" is, for me like an invitation to a great feast! Starting with this unbelievable "dish". Robert Greenberg is a great teacher. I have no musical training or ability, just appreciation, but I can now hold my own in a discussion of music and composers. Prof. Greenberg is able to put music in a historical context as well as the personalities of the composers. His excitement for telling the "story" draws you in and keeps you wanting more. You may find yourself wanting to learn more about the history of a country, the food, the literature, etc, just because you had a taste of the music. There is truly nothing better than a great "story" well told! I am so pleased the Teaching Company has found and featured world class instructors so you and I can enjoy the learning! And I am overjoyed they are now available at Audible! I just can not say enough about this awesome course, I hope you enjoy it as much as I do! There are very few books that seem to take advantage of audiobook technology as this one has. It is a lecture explaining the origin of music, as well as the developments and changes of schools of thought behind each form of music and how to develop an ear for it, with snippets of the music discussed broken down in each lecture to clarify the lecturer's point, followed by the full piece discussed at the end. I feel like I can understand music, even modern music, better. I bought this series on cassette when my library was getting rid of all their cassettes. The material was excellent but the quality of the used cassettes was awful, I had to stop less than halfway through because it was so frustrating, I thought of purchasing the set on CD but the price was pretty high. Now I can hear it all in perfect condition at a great price! Robert Greenberg is smart and funny and presents the material in a way that is accessible to anyone. I'm delighted that we now get access to The Great Courses at our regular credit price!